"Rogue with a capital "R""
Ramses Gold Casino is more or less connected to the nasty brood of casinos – the Affpower group, which was caught in 2016 for using pirated software. They are definitely the underbelly of the online casino industry. Nasty individuals who would rather lie, steal, and cheat than play a fair game. 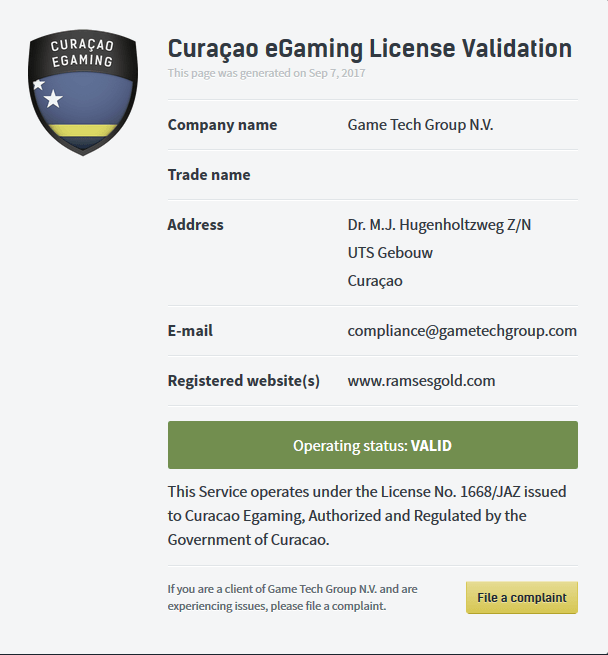 Ramses Gold (www.ramsesgold.com) is owned and operated by Game Tech Group N.V., of Dr. M.J. Hugenholtzweg Z/N, UTS Gebouw, Curaçao © 2015 and its wholly owned subsidiary, Supaze Limited of Voukourestiou, 25 NEPTUNE HOUSE, 1st floor, Flat/Office 11 3045, Limasol, Cyprus. Ramses Gold operates under Master License No. 1668/JAZ, granted by the Government of Curaçao. That’s what you need to watch out for. This licensing entity will do nothing if this casino decides to confiscate your winnings. This licensing entity won’t do diddly squat if this casino uses cheating software. To operate a casino using a license from Curaçao eGaming is about as valid as pilot’s license for a cross-eyed hippopotamus. Worthless. Yet, they are taking punters’ money – illegally I might add. If you are taking bets from the UK and are not licensed by the UKGC, you are not only cheating the system – you are putting UK punters at risk. There is not due diligence and player protection that is required by UKGC licensed casinos. Here they admit taking UK bets. My chat session with Ramses Gold customer support. So in essence, don’t walk away – run. 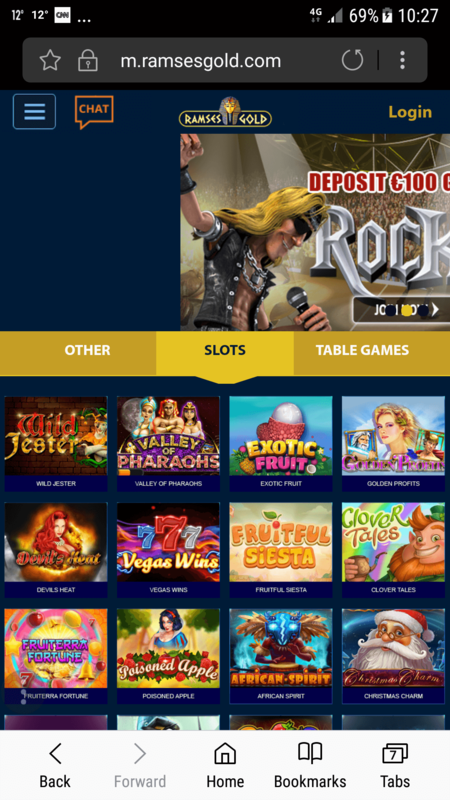 This casino is connected to the AffPower group of casinos which has been caught in the past using cheating software. Avoid at all costs. 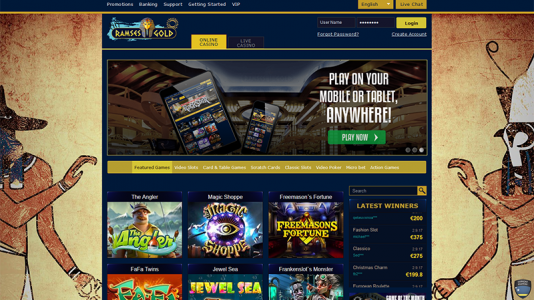 Ramses Gold Casino is mobile friendly and will rip you off from there as well as your desk top. I just had a little chat with the chat support at Ramses Gold Casino. Ramses Gold was pegged as being part of the toxic brood of crap casinos under the Affpower wing. It’s connected by a shared license. Anyway, we have a PAB for these guys, and the operator came back to us stating that he was going to deal with thePAB, but he saw that his casino was being listed as an Affpower clip shot joint, and he was adamant that his casino has nothing to do with them. He didn’t want to deal with someone so biased. Fair enough, I know that casino ownership can be convoluted at times when people are playing shell games, so I decided to just check the casino out for myself. I made a withdrawal on Monday 14th August for 2000 euros. The following day, I received a fairly standard request for ID and other documents. After a back and forth exchange I provided all of the requested documents and received an email confirming all was okay. I requested to be paid by bank transfer and provided all of the information asked such as SWIFT/BIC. It is now 16 days later and despite having emailed them over and over I have not received any replies and I have not received my withdrawal either. I have broken no rules and have received no phone calls, emails or other communication to explain why my withdrawal has not been processed. Every time I phone the contact number it says this service is busy please try later. Contacting Live Chat is useless as they always say “email support@ramsesgold.com” which I then do but still have no response. This casino should be avoided at all costs.